Wow. I love the work. This week was super crazy, and filled with so many miracles and so many lessons to be learned. 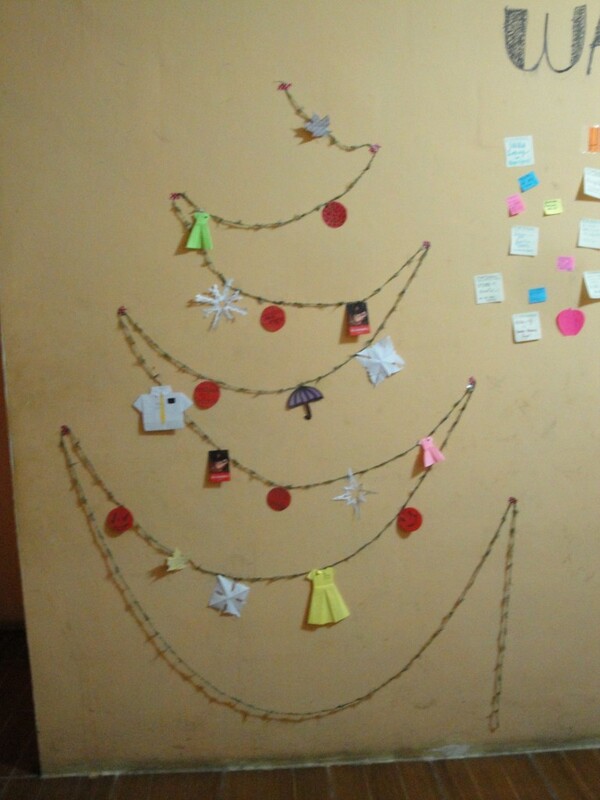 Here in El Salvador, the tradition for Christmas, is a little different than what I am used to. Here the tradition is a huge dinner in 24, Noche Buena, which consists, of chicken, rice, potato salad and bread… They also have fireworks, firecrackers, and a ton of small devices to lite on fire. 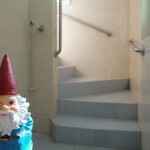 I was on my toes all week long, and I was so startled a couple times. It sounds like world war three here. Anyways, In Noche Buena we had dinner four times! I felt like I was going to explode! I honestly never want to see chicken again in my life. But I am so grateful for this ward and all of the support that we have received. Our Christmas miracle came when we went to visit a family that was recently baptized. They live in a tiny community behind our house and have some neighbors that we have tried to visit, but weren’t super positive. Well, we were walking by and the sister shouted “Hermanas! Come here! I have a question!” We went over and asked her how we could help. She is a beautiful young woman and has a young baby and her boyfriend. Well the first thing that she said was, “Hermanas we need your help to get married, we would like to be baptized.” I honestly had no idea what to say. It was the perfect Christmas miracle. The Lord is so merciful and this work is so beautiful. We have been trying hard to get people to come to church. With so much going on, it is easy for people to make excuses to not go to church. 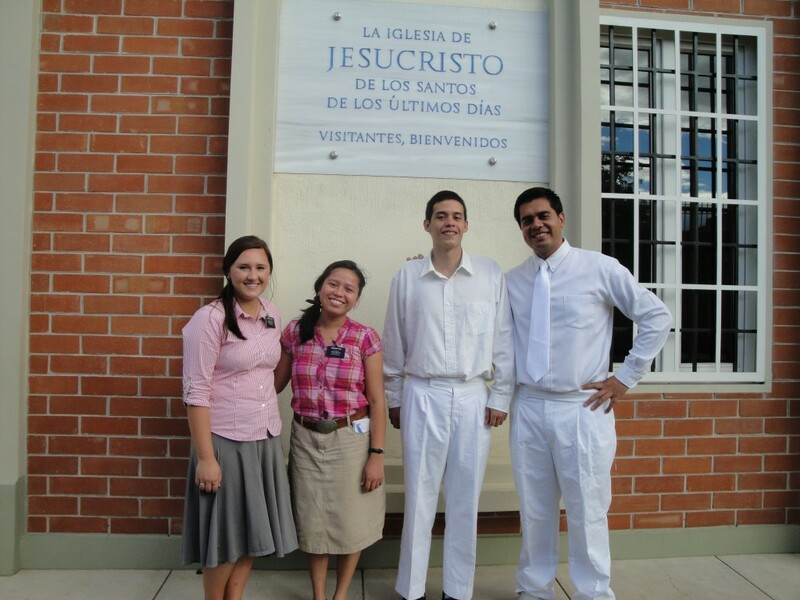 Well, yesterday Hermana Avila and I went to church without a single investigator. I felt so bad and was having a major self-evaluation. Well just before I broke down into tears, one of our ancient and eternal investigators walked into the chapel. My heart stopped. I love this little old man. He is kind of super crazy, but he wanted to come to church, and thoroughly enjoyed himself. Wow… How merciful our Heavenly Father. Wow, what a week. As we get closer to the new years I have tried to dedicate myself more to the basics of the gospel and missionary work. I was reading a general conference talk from Dieter F. Uchtdorf and I loved this quote, “Your testimony of the Living Son of God… may not come as quickly as you desire but I promise you this: if you do your part, it will come. And it will be glorious.” This work is so glorious! It really helped motivate me to start over, and make sure that I always do my part. I love you all! Thank you for your love and support!! I have learned so many things this week, and I really cannot believe how fast the time flies. This past week we went caroling with our Ward Mission Leader and a couple of the Ward Missionaries. We visited almost every family in the ward, active and less active. It was such a tender experience to see how happy some of the people were and it was beautiful to be able to share a little of the Christmas spirit with them. I love Christmas! This is such a beautiful time of the year to focus on our savior and on his Atonement. We have been studying a lot of the Christmas story as a companionship and It is amazing to see the many things that we can learn from this story. This past week I was really struck by the story of Mary when the angel Gabriel told her who she would be. I was so struck by her response. ” He aqui, la sierva del Señor” The handmaiden, or servant of the Lord. She had such faith, such perfect trust in her Heavenly Father. I have been trying to do the same, to really strengthen my faith and rely on my Savior. “. It was super awesome! I love my companion. This week taught us so much, and she is the epitome of all patience and charity. She has really taught me to always have a 24 hour smile. I love her so much! She said something that really impacted me. She said, “We didn’t come as soldiers, we become soldiers”. The lord has really refined us this week and I am so grateful for the atonement of my Savior. I hope that you all have a very Merry Christmas. Remember. He is the Gift, He is the King. He is our Savior… and I am his servant. May the Lord Bless and Keep you all. Thank you for all of your prayers, your love and your support. P.S. 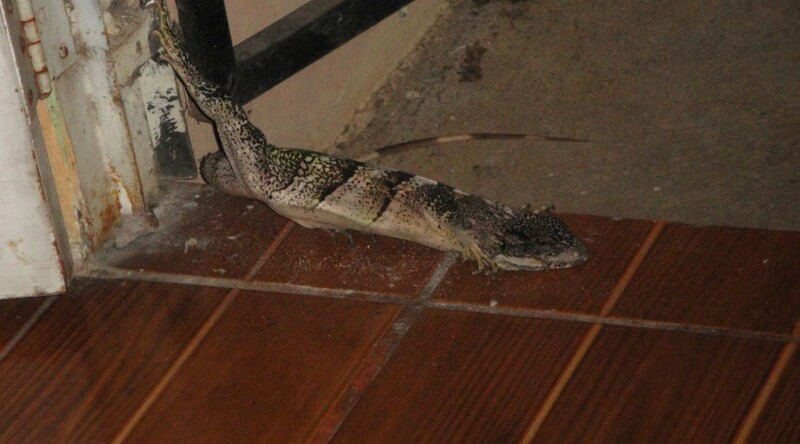 We came home one night this week to find the largest lizard I have seen in my life sitting on our doorstep…. 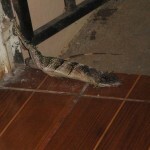 it was quite traumatizing…. Hola Hola from El Salvador! This week was so crazy, I am not sure where to start. My companion and I got lost in the Capitol, we had a Multi Zone Conference, and ended the week with Stake Conference. The Days are getting shorter, and the Lord is hastening this work, we are just trying to keep up with him. This week I finished the Book of Mormon for the first time in Spanish! I know that the Book of Mormon is true. I love this book so much. It was as if I had read it for the first time ever, every page had some new insight, some precious treasure of knowledge. Though I did not understand every word, It really helped me improve my Spanish a lot. This week was a week of Miracles. I have learned so much about prayer and about true scripture study. I know that as we focus on the small, simple parts of obedience, the Lord will bless us. This week was also a week of Faith. There were so many times when we had done all that we could do, and all that was left was trust in the Lord and in his timing, and without fail, every time He had a blessing in store for us. I know this work is true. I know that the Lord Lives. I know that he loves us perfectly. I know that Heavenly Father is a God of Miracles. I know that he protects and leads his missionaries. It’s just a short one this week, but thank you all for your love and support! Hola! Well, hello my friends and family! 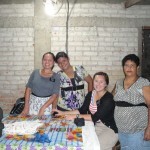 Here we are, plugging along and still keep in at it here in El Salvador. I sure love being a missionary. This week the Lord has taught me so much. There were so many times where I thought I could literally not take another step and there was the Savior taking it with me. I go around all day saying. “Si se puedo, si se puedo” channeling my little engine vibe. It has been a little crazy but at the end of the day I can look back and see all of the miracles that happened. This week we had another Baptism! His name is Julio and he is so awesome! We have only taught him about a month but he was so prepared to receive the gospel message. When we met him he had shoulder length hair and a mountain of problems. He changed so many things, made so much improvement and, al fin, cut his hair and on Saturday was baptized. It was amazing to see the atonement work in his life. 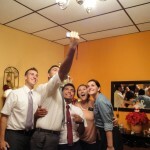 I am sure that he will be a great missionary one day. This week I had a very sacred experience. 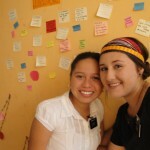 Hermana Avila and I were walking by a member’s house and the Hermana called us into her house. Her family is trying super hard to prepare to be sealed. She told us about a dream that she had. She saw an image of the nativity and heard a voice saying “I am he that was born of Mary in a manger and because of your sacrifices you will be sealed with your children in the temple”. The next Sunday every member of their family stood up and shared their testimony. I love this work. I love you all! What an absolutely crazy, crazy week…. First things first….. I am training!! 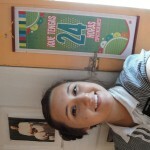 My companion is Hermana Avila from Honduras. She is super awesome! It has definitely already taught me so much. It has been kind of hard adjusting to speaking Spanish 24/7 but she is a great help. She teaches without fear and is super bubbly. She automatically loves everyone and was ready to go right to work. I realized that I have no idea what I am doing… at all. But, here is where the Lord steps in and reminds me that I do nothing, and that it is his work. I don’t think I had ever truly prayed in my life until this week. I have spent so much time on my knees in conversation with my Heavenly Father, and every time I pour out my heart in prayer, he fills me again with peace and strength. I have definitely learned that I can do hard things, and with Hermana Avila, I think the Lord has a lot in store for us this change. We are working hard to find new investigators that are really truly positive and ready to receive us and progress… We happened to baptize almost all of the investigators that we had Speaking of which, we baptized a family this week!! 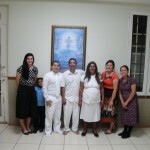 It was Hermana Avila and my first day together and she got to watch a family enter the waters of baptism. I love this family so much! We contacted them through the hermano, Carlos. 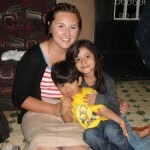 We helped them build their house and from there started to teach them. Their daughter was baptized about a month ago…we just had to help them get married first. 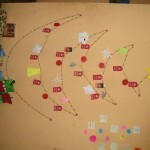 But, he is from Guatemala, and so it was an extremely long and complicated process. But, with the help of the members and miracles from the Lord, this last week they were married and then baptized. I straightened the Hermanas hair and members gave them a cake and nicer clothes. 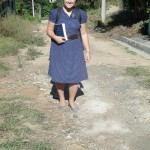 Another Hermana in the ward is a lawyer and she married them. It was so beautiful they were so happy! My trainer, Hermana Judd and her family got to come too, and it was cool to see her one last time. How beautiful works our Heavenly Father! 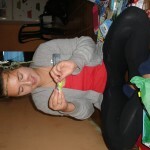 De, alli… we have just been working, working, working…. we are hoping to have another baptism this weekend! We just got to keep plugging a long and find new people to teach. Thank you for your support, your love and your prayers, I have really felt your strength this week in moments when I needed it. I love you all!